High Power shooters have a bunch of gear to carry to the firing line–pad, shooting jacket, scope stand, spotting scope, ammo, log-book and rifle(s). If you’re shooting F-Class, add a heavy front rest and 15-lb sand-bag to the list. 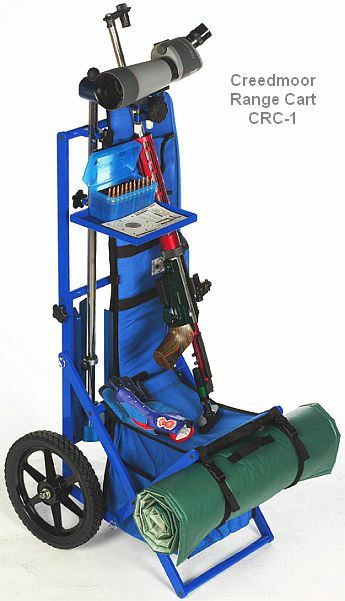 A range cart makes life much easier, particularly if the shooting area’s a long way from the parking lot. Creedmoor Sports makes a folding range cart that is very popular with the iron sights crowd. This unit features 14″ ball-bearing wheels and the frame is made from solid aluminum–not lightweight tubing that can bend or crack. Lift a simple locking lever and the cart folds. The cart can be completely dis-assembled, without tools, to fit in a suitcase (collapsed size 30″ x 17″ x 8″). The Creedmoor cart retails for $499.00, and that includes a rifle case, tray, and rain-cover. The rifle case doubles as a rack/holster. 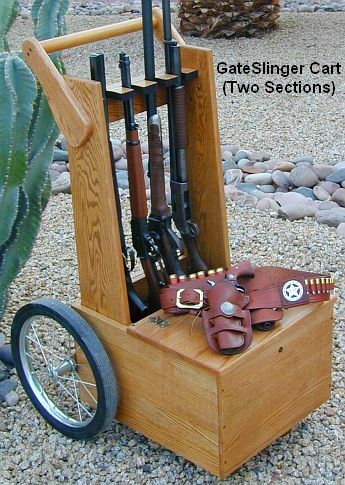 If $499.00 isn’t in the budget, or you’d like to build your own range cart with a lockable storage compartment, you should look at the carts used by Cowboy Action shooters. These wooden carts are heavy, but they provide a stable platform for multiple guns and a nice, solid perch for sitting. There are many do-it-yourself designs available. 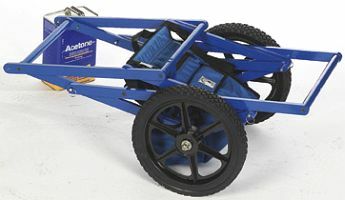 One of our favorites is the GateSlinger cart shown below. This well-balanced design breaks down into two pieces for transport. Click Here for cart plans, and read this “How-to Article” for complete instructions with many photos. Share the post "Range Carts for High Power and Silhouette Shooters"